In order to pick away at the complex layers of Rijeka’s history and culture you sometimes need to get away from the canonical tourist sights and roam further afield, taking in some of the idiosyncratic and often unsung attractions that reveal stories that aren’t always adequately told in the set-piece museums. What follows is a list of the kind of locations that have something to say about the city’s complicated psychogeograpy. Although some of them are a bit far-flung and might require a bus ride or a taxi, most are walkable from the centre and offer excellent opportunities to savour the mixture of residential, park-side and industrial neighbourhoods that give the city on the Kvarner its unique character. RECOMMENDED: The best things to do in Rijeka. Situated on high ground east of the centre (bus 7a or a taxi will get you there), the Astronomy Centre is home to a small observatory and a planetarium offering regular shows about life, the universe and pretty much anything else that suits itself to rich visual effects. English-language performances are given on Wednesday evenings. The structure itself is an ambitious adaptation of an Italian anti-aircraft emplacement built in World War II, another example of Rijeka’s appetite for re-purposing the architectural fragments bequeathed to the city by past masters. 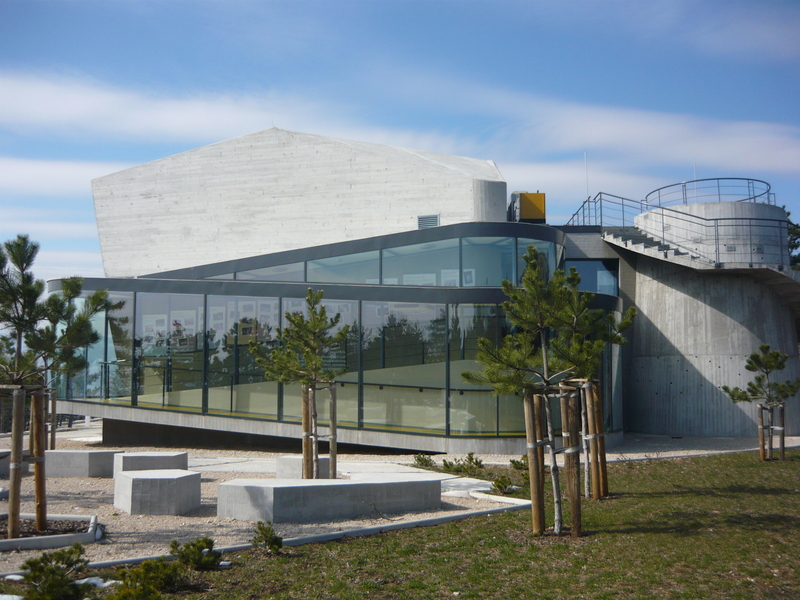 The centre’s Café Galileo has a fabulous rooftop terrace with sweeping views of Rijeka and the Kvarner Gulf. 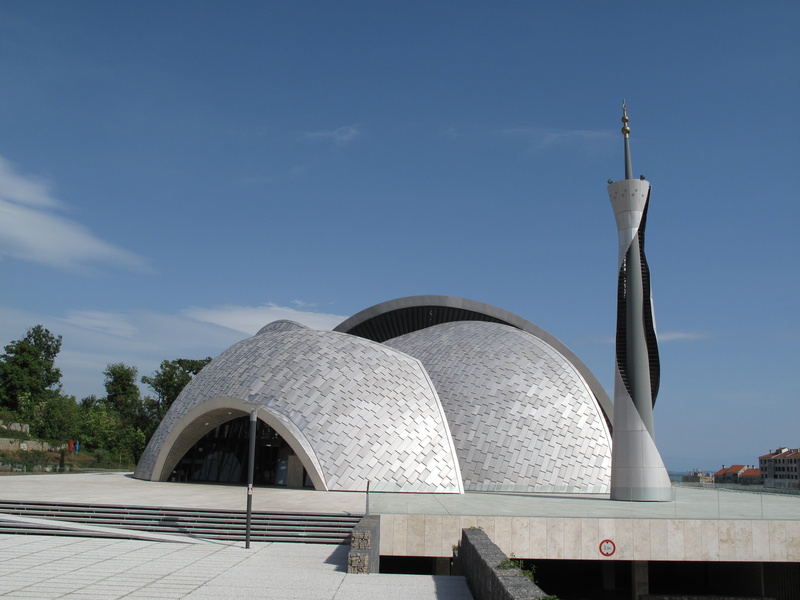 Arguably the finest contemporary building you are likely to see in Rijeka, if not anywhere on the Adriatic, the city’s stunning new mosque looks more like a science-fiction illustrator’s idea of a base on the moon than any public building you might have so far seen in Croatia. Built to designs by abstract sculptor Dušan Džamonija, it takes the form of a silvery fragmented dome – as if a Chocolate Orange is being pulled slowly apart so you can see the segments sliding away from each other. With a boldly geometric minaret corkscrewing upwards to one side and the blue Adriatic in the background, it’s a genuinely thrilling sight. First tested in the presence of Habsburg naval officers in 1866, the torpedo was invented in Rijeka and remained at the centre of its manufacturing industry for 100 years. Engineer and industrialist Robert Whitehead (originally from Bolton in Lancashire) was the man behind the weapon’s success, turning the city into the world leader in torpedo construction. Torpedoes were tested by launching them from a steel and concrete gantry at the end of a short pier about 2km west of the centre (follow the signs to “Torpedo”, the matter-of-fact name of the former armaments factory). The launch station is just a derelict shell nowadays, but with the cranes of the 3 Maj shipyard and the distant form of Mount Učka in the background, it’s a pretty evocative photo opportunity. Rising above Kozala Cemetery to the east is the soaring spear-like tower of the city’s most remarkable church, St Romuald’s, built by the Italians during the 1930s to serve as a statement of not just Italian, but also Fascist control over the city. 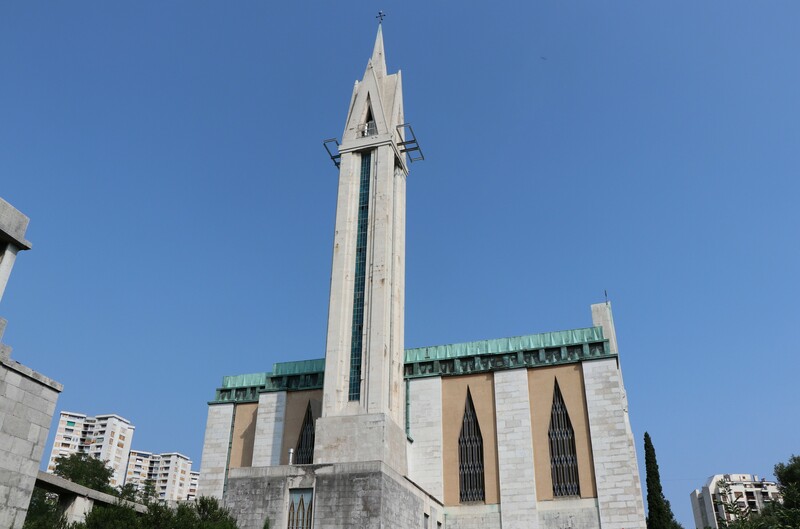 The base of the church was built just after Gabriele D’Annunzio’s brief rule over Rijeka to serve as an ossuary for his proto-fascist legionaries. 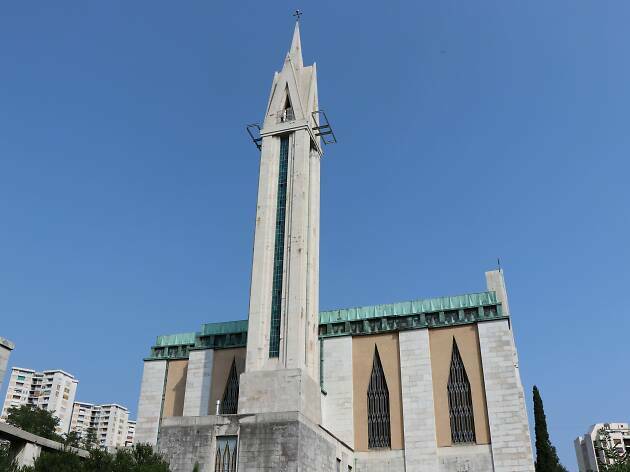 The church itself functioned as both a focal point for Italian war graves and a celebratory symbol of Rijeka’s forced incorporation into Italy. 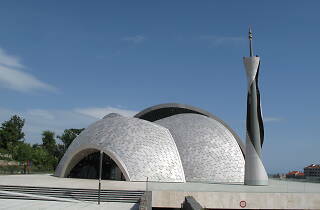 Architect Bruno Angheben opted for a lean functionalist style incorporating elements of Futurism, producing an edifice that’s an outstanding representative of its epoch, and still functions as a (Croatian Catholic) church today. The torpedo man Robert Whitehead built a mausoleum for himself and his family in Kozala, the city’s main cemetery on a hillside above the centre. Whitehead ended up being buried in a Sussex churchyard, but his intended palace of rest is still here, a monumental Art-Nouveau pyramid that looks down on Kozala’s other grand tombs from the graveyard’s highest point. 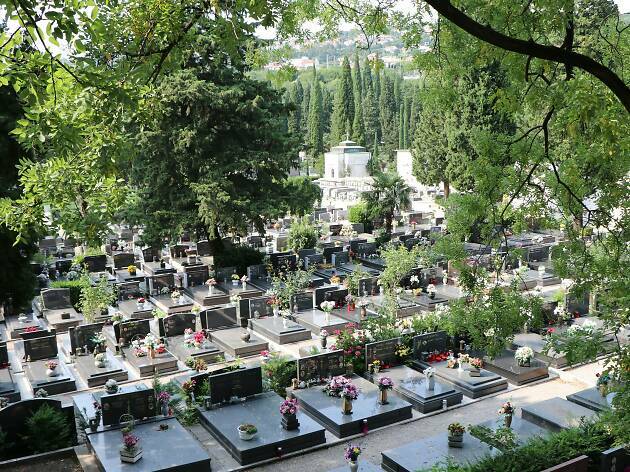 And if you’ve ever been taken by the idea of cemeteries as public parks, then Kozala is one of Europe’s finest, with soaring poplars, lines of neatly clipped hedge, and a sprinkling of palm trees providing an air of Mediterranean luxuriance. 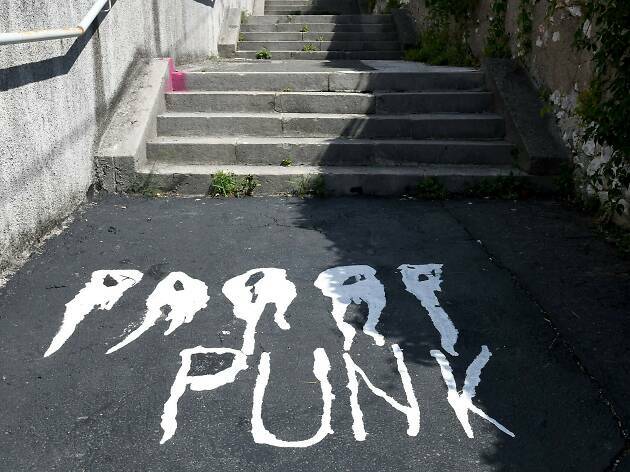 Heading downhill from Kozala, on a stepped alleyway that runs down towards Vladimir Nazor park, the words “Punk Paraf”, suddenly appear beneath your feet in wavy streaks of white paint. This act of teen vandalism was carried out by members of Croatia’s first-ever punk group Paraf in the summer of 1977, somehow surviving to become the preserve of cultural-heritage preservationists four decades later. Repainted in 2018 it looks far too bright to a true relic of Rijeka’s new wave; hopefully it will be scuffed back to authenticity by the ongoing passage of feet. The battered grey boat moored at the end of Wenzelova has a rather more illustrious history than might first appear. Built in 1938 for an Italian fruit-shipping company (when it was, quite literally, a banana-boat), the vessel saw service as a German minesweeper in World War II before being sunk, salvaged, and reconstructed to serve as a Yugoslav navy training boat. Its period of glory came when, renamed Galeb (Seagull), it entered service as the presidential yacht of Josip Broz Tito. Tito visited Britain on the Galeb in 1953, and frequently used the ship to entertain visiting heads of state. 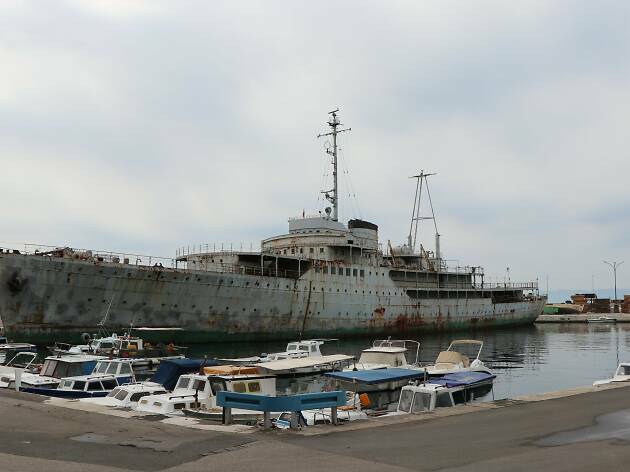 A Greek businessman bought the ship in the late 1990s and sent it to Rijeka for repairs. When it became clear that he couldn’t pay the bill, the city of Rijeka took it over. 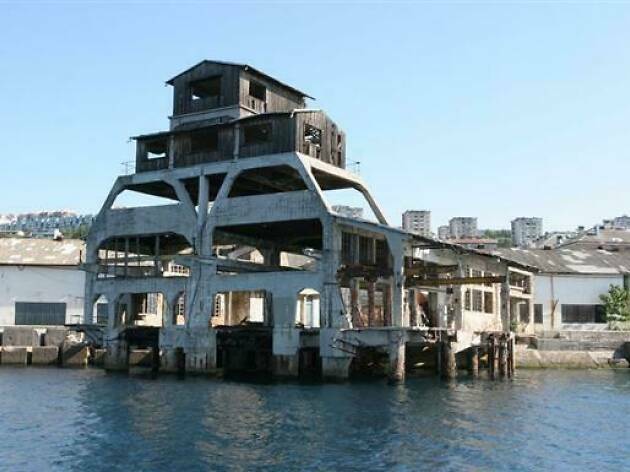 It is now set to become a floating history museum, but given the controversial heritage of Tito - a hero to some, a monstrous dictator to others – the Galeb itself looks set to remain an ambiguous symbol to say the least.